There are a lot of interesting and desirable guns coming up for sale at Rock Island Auction’s next auction scheduled for 24th-26th June 2016. In fact there are over seven thousand items listed for this particular auction so it is worth a browse if you are in the market for antique, rare and/or classic guns. Amongst that seven thousand plus items on offer is a lot that caught my eye. It comprises a Winchester Model 1887 shotgun in 10 gauge, and a Model 1895 rifle, (Teddy Rooseveldt’s favorite model Winchester) in 30/06. For sale as Lot #23 these two guns are being auctioned together, so you get two for the price of one – sort of. (Picture courtesy Rock Island Auction). Let’s start with the Model 1887 shotgun, which I personally think is THE GUN for Cowboy Action shooting. It’s period correct, it’s a lever gun, and it’s big. The first time I handled one of these it was a ten gauge (they were made in 10 gauge, 12 gauge and sweet 16 gauge). The gun I got hold of had a long waterfowl barrel and it was one of those big, solid chunks of steel that makes you fall in love with it straight away. I don’t know if I would have managed to hit any ducks or geese with it but I surely would have had fun trying. But if you were riding shotgun on a stagecoach then this gun, with a short barrel, would have been near perfect. This is a gun for the “Judge Roy Bean” type of guy of the old west, so when they say “Here comes the Judge” people had better take cover. The Judge Roy Bean Winchester lever action shotgun. This is the later Model 1901. (Picture courtesy imfdb.org). The Winchester Model 1887 was another John Moses Browning design that he created at the request of Winchester. The gun was requested by lawmen of the old west who were of the opinion that a double barreled shotgun was simply not enough gun for some of the situations they needed to handle. With John M Browning’s lever action Model 1887 they had five rounds in the magazine and one in the chamber, and “one up, five down” was good odds when the chips were down and you needed to put a few chaps down. The Winchester Model 1887 was designed for black powder and was updated to smokeless powder in the Model 1901 (the actual gun Judge Roy Bean uses in the movie). You will find the antique Winchester Model 1887 at Rock Island Auction if you click here. The Chiappa reproduction Model 1887. (Picture courtesy Chiappa). Chiappa are making this gun nowadays so if you are a Cowboy Action shooter thinking about what sort of shotgun to choose you might want to have a look at theirs. There are a seven different models including the one for Cowboy Action shown above and a rifled slug version shown below. The Chiappa Model 1887 slug version should prove to be a near perfect deer and wild boar gun. (Picture courtesy Chiappa). You will find the Model 1887 Chiappa guns on their website if you click here. The Chiappa Model 1887 for Cowboy Action can be found if you click here. The Chiappa Model 1887 slug gun can be found if you click here. Moving on to the Winchester Model 1895 rifle this model Winchester was Teddy Rooseveldt’s favorite Winchester rifle. The Winchester 1895 was chambered in a range of calibers that included military and hunting rounds as follows; .30-40 Krag, 7.62×54mmR, .303 British, .30/03, .30/06 Springfield, .35 WCF, .38-72 WCF, .40-72 WCF, and .405 Winchester. These rifles were used in a number of armed conflicts including Spanish–American War, Philippine–American War, Mexican Revolution, Russian Civil War, and the Spanish Civil War. Teddy Rooseveldt favored the .405 Winchester chambering which he regarded as excellent leopard medicine. 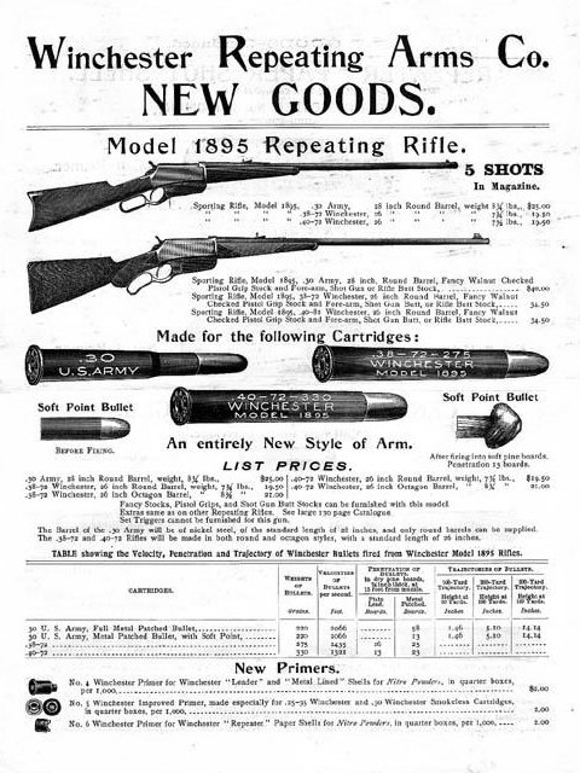 Advertisement for the Winchester Model 1895. The Winchester Model 1895 was the last lever action rifle designed by John M. Browning and it was the first lever action to have a box magazine instead of the traditional tube magazine. This of course made is suitable for the then new cartridges loaded with pointed spitzer bullets such as the .303 British, the 7.62×54R Russian and the 30/06 Springfield. The 1895’s rear locking action was certainly strong enough for the new smokeless higher velocity cartridges such as those although it was and is not as strong as the bolt action rifles of the same time such as Paul Mauser’s 1898 and James Paris Lee’s bolt action which became the Lee Metford and Lee Enfield. A Russian Winchester Model 1897 in 7.62×54mmR complete with stripper clip loading bridge. (Picture courtesy the Internet Movie Firearms Database imfdb.org). I don’t know of any current production versions of the Winchester 1895 although I know Browning had some made in the recent past by Miroku of Japan. For those interested you will find a review of the Winchester 1894 on American Rifleman if you click here, and a review of the later Miroku made Browning reproduction here. So there you have it, two icons of the history of US gunmaking, two icons of American history. Both available for not a lot of money at Rock Island Auction. So if you are a collector or enthusiast this auction lot is worth a look. Also worth a look is the video below from hickok45’s YouTube channel.